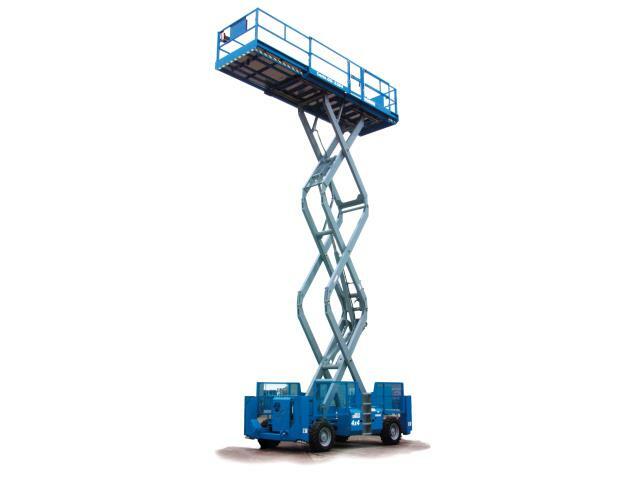 The ultimate scissor lift for narrow, rough terrain aplications. Large platform with durable diamond-plate aluminum flooring. A single 60 in (1.52 m) multi-position slide-out extension deck, on the front of the machine, comes standard. A second 48 in (1.22 m) slide-outextension deck, on the rear of the machine, is available as an option. Slide-out engine tray allows easy access to components. Powered by GM Gas/LPG engine (standard) or Deutz Diesel engine multi-position slide-out extension deck, on the front of the machine, comes standard. A second 48 in (1.22 m) slide-outextension deck, on the rear of the machine, is available as an option.